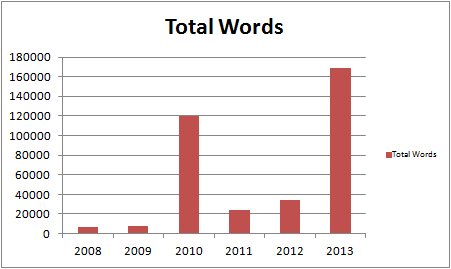 However you measure it, 2013 was my most productive year in the 20 odd years I’ve been dabbling with this writing malarkey. Lots of good numbers there, starting with the total words written – just over 169,000 words. That’s my most productive year so far. The only year that comes close was 2010 when I wrote the original version of The Ghost Smuggler and it’s still almost 50,000 words more than I managed that year. Those words took me 11 days 1 hour 30 minutes to write – another record breaking year. Those numbers look even better in light of this graph which shows the number of words I wrote per day across the whole year. I didn’t start my current writing streak (now sitting at 185 days) until 30th June. Up until that point I’d only written for about 80 days of the year. A full year writing streak would probably get me close to 300,000 words. By my count, I’ve written around 420,000 words of fiction since I started writing which is a good chunk towards the mythical 1,000,000 words various people have claimed you need to get out of your system before your writing becomes any good. 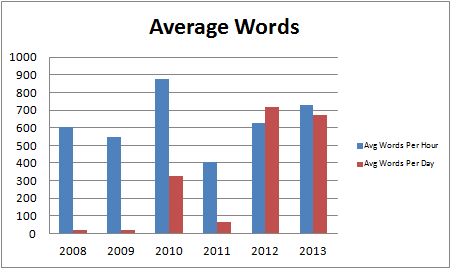 Interestingly, my overall words per hour stayed pretty constant between 2012 and 2013 – 726 vs 626. As did the average number of words I wrote per day – 674 vs 719. That’s pretty low, even for a part timer like me and I’d like to see that number well above Stephen King’s suggested 1,000 words a day in 2014. Naturally, all that writing resulted in a lot of new fiction. Two novel first drafts of course (The Ghost Smuggler at 73,936 words and Glitch at 65,228), plus 16 new short stories. A couple still need revising but I hit another milestone last night – my 60th completed story. Submissions went well with 64 submissions (another record) and 7 acceptances (yet another record) taking my total number of acceptances to 20. A couple of those seem to be AWOL so the number of published stories is less than that. The number of blog posts was a surprise – 107 compared to last year’s 56. A chunk of those were weekly metrics posts but I’ve been neglecting the blog recently and I was expecting a lower number. The reason for that is simply I’ve been focusing on writing fiction and fitting the blog in where I can. I’ve missed a few opportunities to prattle on about events I’ve been to or movies or running injuries but until I find myself with more time, that’s the way it’s going to have to be. So, a very good year from a writing perspective. 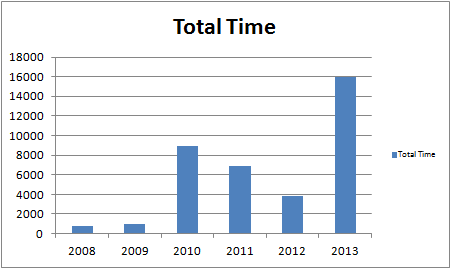 I think I broke every personal record I track and I’m hoping to continue that in 2014.